Thanksgiving is always a joint birthday/thanksgiving affair in our family. My sister and I were both born the Friday after Thanksgiving, 3 years apart, so we’ve always had joint birthdays. Yes, we're ‘anniversary babies’. Um, ewww. So anyway, the Spatchmo clan is together in New Mexico for Thanksgiving last year. Sis and I are opening birthday gifts when I see my sister open a gift from our mother. All I can tell is that it’s one of those corked ceramic saving jar things. You know the ones that have sayings like ‘Swear Jar’, ‘Shoe Fund’, etc.? Her face just falls and I quickly ask her to show it to me. 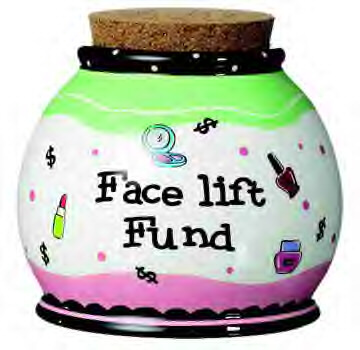 She turns it and I read ‘Face Lift Fund’. Wow. Mind you my sister looks great and she’s only 44. She in no way, shape or form needs a facelift. Beyond that, it’s just freaking mean. Your mother?! With mothers like that, who needs enemas or however that goes. I am all over mom in a heartbeat. “I cannot believe you gave that to her! That is just mean!” Even pop jumps in on it about how it really wasn’t nice.